dandyhorse knows most of you are still out there biking it and liking it! But there are many people who turn to TTC or SOV (single occupancy vehicle) in winter. So we decided to do a special winter Bike Spotting set of some dashing (and dandy) duos and asked them: Why is the bike still the best way to get around in winter? 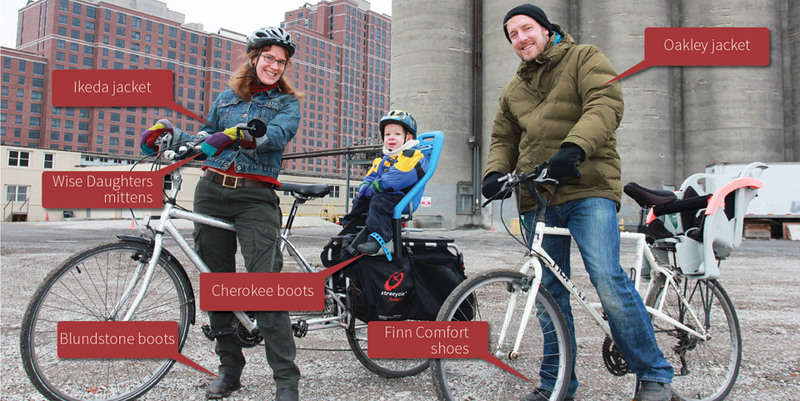 We also asked them what they wear while winter wheeling around town. Special thanks to dandies Randy Chung (design and web programming), Sarah Greene (web editor), Kyuwon Kim (social media) and Victoria Salvas (newsletter and circulation) for their help in putting this, and our first dandy newsletter together for the holidays. And, finally, a Big Thanks to long-time dandy photographic contributor Yvonne Bambrick for these great photos of some of our dearest dandies! I try to layer as much as possible in the winter. I always wear a base layer (including long underwear if it’s really cold), a thin down jacket – this one was bought on sale for less than $10 at Club Monaco and an outer shell or jacket on top. I have two Rapha jackets I often wear and if it’s wet out I’ll throw another rain layer on top of that. Mitts are essential winter gear for me as are waterproof overshoes. The last thing I want is wet, cold feet. My hands get cold easily, so when the temperature dips, I’ll wear the warmest, puffiest MEC mitts I can. Until then I’ll don knits mitts, ‘cause they tend to breathe pretty nicely. I’ll also wear MEC rain pants if it’s extra mucky out – they zip off easily and insulate from the wind. My ears also freeze, so a hat is essential – this one is from Paul Smith – and I’m not beyond sticking a cycling skullcap under my hat. Perhaps the most important winter bike gear I have are fenders on my bike. My Marinoni is my everyday winter ride and it sports MEC fenders. I’ll carry a slightly bigger courier bag in winter to throw excess layers into when I start overheating. I encourage my kids Sidney, 4, Simon, 7, and Henry 10, to also layer and really pay attention to keeping their hands and feet warm. They love riding anytime and weather seems to be no barrier to when they get on their bikes. In fact, the more snow and ice and slop the better, as far as they are concerned – it’s nothing that can’t be fixed with a hot chocolate or a band-aid. They don’t care about fenders. Why do you ride in the wintertime? I started riding year round when I moved to Toronto in 1987. 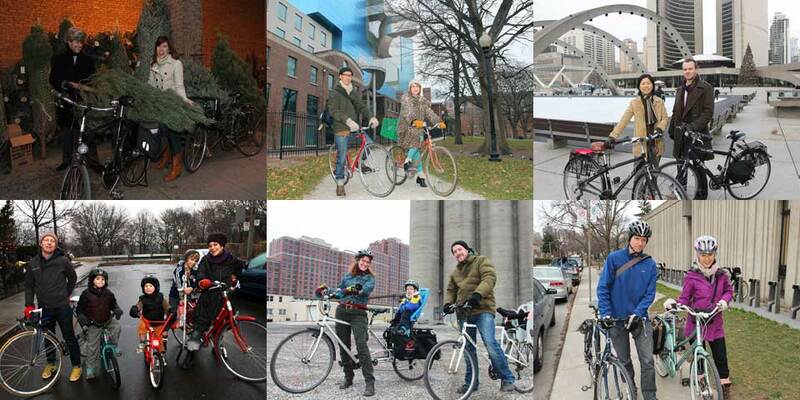 There weren’t that many people riding in the winter then – you literally knew them or their bikes. Biking is the best way to get around in winter for the same reason it’s the best any other time of year: it’s faster, more convenient, healthier, more sustainable and ultimately, much more fun. Riding in the sun on a clear, crisp winter day is heaven. Writer and dandyhorse senior editor Steve Brearton has been riding year round for 26 years. Steve has been contributing to dandyhorse since issue #1! View Steve, Liz and family’s individual profile here with added detail photos. I’m wearing mittens from Wise Daughters Craft Market, Blundstone boots, Dockers, a jacket from Ikeda and a sweater from Costa Blanca. I’m also wearing a helmet from Urbane Cyclist (the Xtracycle extension is from there too) and my bike is from Set Me Free. We use a child seat from Sweet Pete’s. Charlie is wearing a Woodland jacket, pants from the Children’s Place, Cherokee boots, mimiTENS mittens from Baby On The Hip, a helmet from Swete Pete’s and a handmade scarf (care of Nana Oya). Why is it still best to get around by bike in winter? I messed up my knee riding in high gear during winter, a while back. I have learned not to push quite as hard when it’s cold. I have also stopped riding when there’s ice and slush on the roads. And I try to remember that the days are shorter and that good bike lights are more important now. I don’t take Charlie out on the bike when it’s below -5 or so. Otherwise, riding in winter is still the fastest, cheapest, easiest and healthiest way to get around town. My bike is my de facto mode of transportation. I love the freedom and the fresh air and I hate to wait. Chief dandy photographer Molly Crealock has been riding year-round in Toronto for 15 years. Molly has been contributing to dandyhorse since the start, including most of our fabulous Heels on Wheels profiles. I’m wearing an Oakley jacket, jeans from Jack & Jones, Finn Comfort shoes, and a Wind River hat and gloves. I got my bike at Bike Pirates. A biodynamic farmer by training, Jan is working to realize his dream farm: “Deer Fields Farm.” He is currently working at Dufferin Grove Park in Toronto. He’s been riding all year since age 12. View Molly, Jan and Charlie’s individual profile here with additional detail photos. Please tell us about what you are wearing? I’m not wearing any bike-specific gear. I think the trick is just to layer up and keep warm. I’ve got a pea coat and big wool scarf over a knit cardigan over a button down shirt over a t-shirt. I have knit mittens on, and sometimes when it’s colder, I’ll have smaller gloves under those mitts. I have a toque that I can fold down over my ears when necessary, and some insulated winter boots. I have YNOT straps on my pedals, which are great for the winter, because I can adjust them out to fit over my boots. When it gets messy out, I have a clip-on fender for my back wheel, but I didn’t need it today. Why is biking the best way to go even in the winter? Biking is a great way to get around in winter because it’s just easier. No waiting for streetcars, no searching (and paying) for parking. 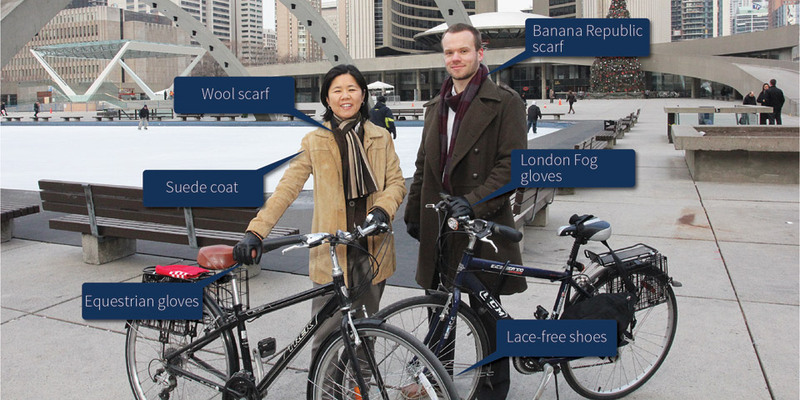 Web developer and designer Randy Chung has been winter biking for about 3 years now. Randy has been our web programmer and designer since we launched our fab new site here at dandyhorsemagazine.com – thanks Randy! Please tell us about what you are wearing. I’m wearing a long-sleeved shirt underneath my dress for extra warmth, and two pairs of socks – one under my tights, and one over them. My coat is a furry, leopard print, vintage number that I picked up pretty cheap in the UK, but it’s already seen me through two winters, and I’m hoping it’ll last at least another one! I wear a woolly beanie under my helmet – I deliberately bought a helmet with an expandable interior so that I could wear a hat underneath it to keep my ears warm in the winter. I also wear gloves that have mitten flaps so that I can easily get my fingers out to lock and unlock my bike. When it starts to get even colder, I’ll swap my tights for fleece-lined leggings, wear an extra scarf, swap my ankle socks for over-knee ones, and bring out my winter boots. Biking is still the quickest way to get around in the winter, and even though it’s cold, if you dress appropriately, you don’t really feel it. Plus you don’t have to stand around waiting for transit. Katie is a research assistant at the Modern Literature and Culture Research Centre at Ryerson University. This is her first winter biking in Toronto, since moving here just over a year ago. View Randy and Katie’s individual profile here with detail photos. Cold weather cycling wear is all about layers for me. If it was raining or snowing, I would also have my bright Gore-Tex shell on to keep me dry. Today, I’m wearing a suede car coat and double wool scarf both from Coach, a Zara lambswool tweed jacket, Brooks Brothers cotton dress shirt and wool pants, Sugoi blend fabric socks and Bally boots. My equestrian gloves are lined with 40 grams of insulation and were purchased from the Royal Agricultural Winter Fair. My red toque is by Raising the Roof, a great charity that raises awareness about homelessness. I’m also wearing two pieces of jewellery that are special to me. A fine silver ring by renowned Mexican artist Rodolfo Padilla. It’s a loved souvenir from my Guadalajara Ciclovia trip and it showcases relief sculptures of a cyclist wearing a sombrero. Finally, I’m wearing a beautiful jade Kwan Yin “Goddess of Mercy” pendant. It brings peace and compassion to my heart and hopefully on the road as well. Biking is still one of the best ways to get around because it’s cheaper, often faster, and it gives me a chance to stay in shape during the long winter months. It’s an amazing way to burn off the additional holiday calories! Krystin Wong-Tam is councillor for Ward 27, Toronto Centre-Rosedale. After cycling through a Waterloo winter during grad school, I learned that good gloves and a warm coat are absolute necessities for staying warm. My warm leather gloves are from London Fog and my coat was a lucky find from a boutique shop I stumbled upon in Montreal. It stops the wind and is incredibly warm with the right layers. While I like to arrive to work prepared for the day, I always leave my better shoes in the office as the weather gets worse and the salt trucks come out. Similarly, I will don jeans for the ride if the roads are wet. Cycling is much more enjoyable when the seasonal slush and spray are non-issues. While the TTC makes it easy for me to get from my home near Yonge and St. Clair to City Hall, cycling is almost always the better option. In the warm months, I want to take advantage of the great weather. In the fall and winter, cycling is still the fastest way to get from A to B, especially as the subway hits capacity at rush hour with students commuting downtown. Tristan is Constituency and Planning Assistant to Councillor Wong-Tam. View the Kristyn and Tristan’s individual profile here, with detail photos. 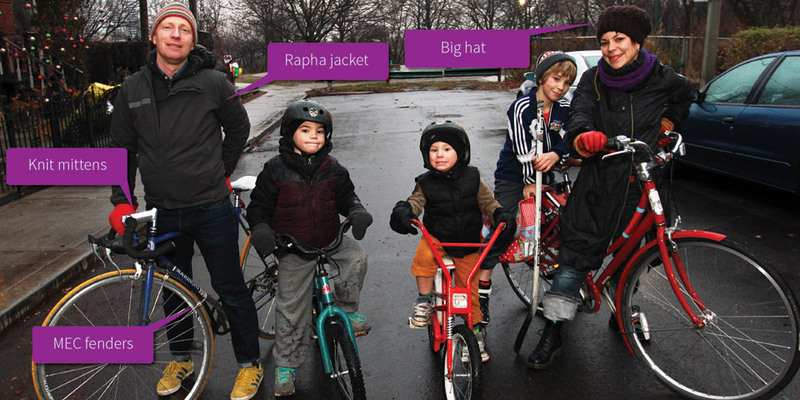 What do you wear when winter cycling? I need to have the versatility of clothes appropriate for court while being comfortable on my bike. I wear dress boots that are waterproofed with the Italian waterproofing paste from MEC. I wear my suit. My riding position on my Pashley makes wearing a wool overcoat comfy as ever. With collar popped, the only “technical” clothing I wear are my biking gloves and a neck tube. I find staying cool is the hard part, so I like to wear things I can adjust easily while riding. I can pull the neck tube over or under my mouth. My coat collar can be adjusted to let air in or keep it out. I wear my rabbit fur hat with flaps up or down. Why do you bike in the winter? I used to ride in Winnipeg and Saskatoon winters. That required far more preparation and equipment than here. Toronto winters are a breeze by comparison. I find the TTC expects people to be grateful for packing us in like sardines and waiting for the luxury! Driving in Toronto requires a special kind of masochism. Ian Flett is a lawyer practicing municipal and administrative law downtown and has been biking for 25 years. He first started winter riding in 1990. Toronto has recently enjoyed a few mild winters so I’ve not had to suit up in full weatherproof riding gear recently. In this image, (although you can’t see them) I’m wearing the finest wool socks money can buy (even if you pinched them from your boyfriend’s drawer.) Warm dry feet are one of the most critical elements for winter biking. I recently purchased a light-weight, compact down hooded jacket. It is perfect for layering under stylish wool jackets for extra warmth. Finally, I wear a high visibility neon jacket over just about everything. When the weather is frightful, being visible is key. Safety first, fashion second. The main reason I bike in the winter is the work commute. I enjoy the idea of embracing old man winter rather then battling him. Also, it is delightful to arrive to the office with wind-bitten rosy cheeks and the sense of accomplishment that biking to work can give you. Hot Docs industry programs director Liz Radshaw has been an all-season cyclist since 2003. View Ian and Liz’s individual profile here. 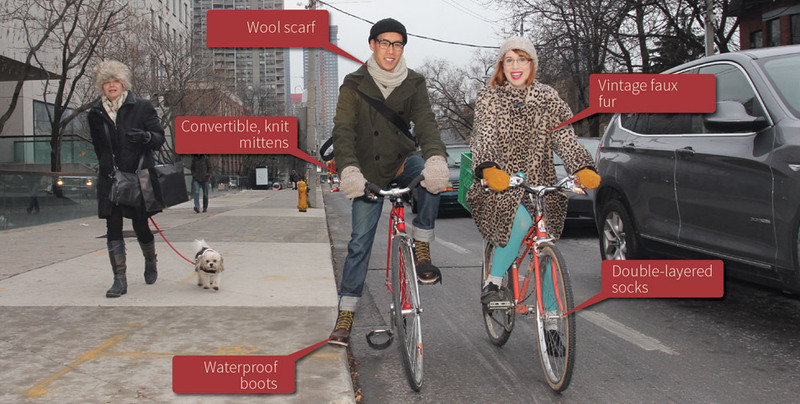 Layering is the best way to dress for winter cycling. It helps me keep my body at the most comfortable temperature, by removing or adjust the layers as I get too warm or cold. My must haves: scarf, wool beret,hat or toque, wool mittens or gloves, Merino wool lightweight long johns, Merino wool lightweight hoodie (long sleeves), Merino wool socks (check out Cycle Toronto‘s Merino wool socks on sale in major bike shops around Toronto), fleece long sleeves or fleece vest, waterproof jacket (long enough to go past my waist), waterproof pants, waterproof gloves, snow boots, or waterproof shoe covers. I tend to bring more layers than most people really need. That’s because I grew up on a tropical island. So I am usually happier to be too warm than too cold. Also, a common misconception is that winter is too cold for cycling. On the contrary, friends who do cycle in the winter tell me they often get too warm, rather than too cold. This is because your body warms up really quickly with the pedalling. It comes down to dressing right to regulate your body temperature. That’s why I find layering works. Why is biking still the best way to go in the winter? Cycling is my primary means of transportation. Even in the winter, I find cycling more enjoyable than being packed in a subway or a streetcar. 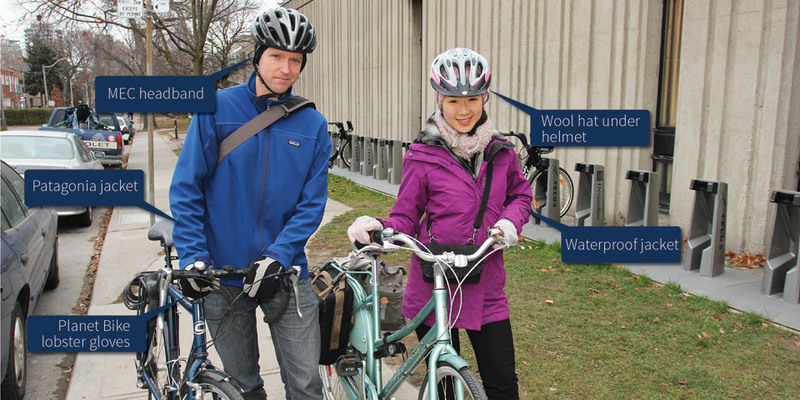 It allows me to experience my commute by enjoying the environment and my neighbourhood. I also enjoy seeing people on the streets and exchanging a friendly smile with them. Lynda is outreach coordinator, ward advocacy co-captain for Bike27, and Street Smarts and Bike Watch volunteer for Cycle Toronto. 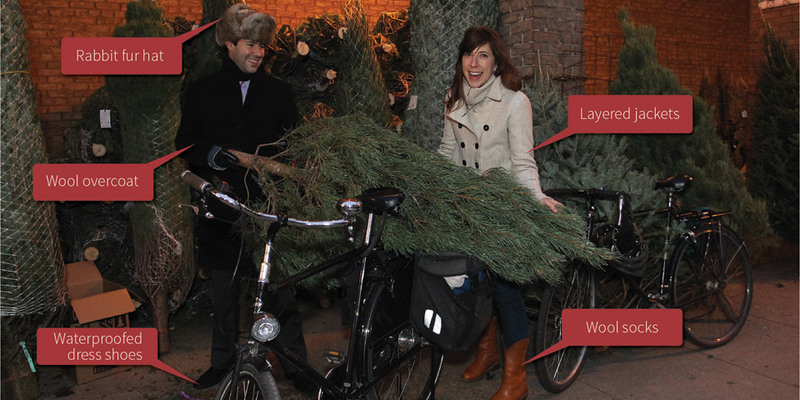 She’s been a year-round cyclist since 2008, but moved to Toronto in 2010 and started winter cycling in 2011. What I’m wearing that you can see: Patagonia Soft Shell Jacket — wind proof & water resistant, MEC Frigorific Headband — when the temperature drops below zero, I typically switch to a balaclava, Planet Bike Borealis lobster gloves — allows pinky & ring fingers to stay together while giving maximum dexterity and good protection from the wind, Serfas TRAX MTB clipless riding shoes — I prefer to ride clipless for my longer commute to Bloor and Bathurst from Jane and Bloor. This is my first year with these particular shoes, so I don’t know how well they’ll stand up in the cold. I’m also wearing nondescript jeans — and to provide great wind protection for really cold days, I add long johns under my jeans. I also have my Giro helmet on. What I’m wearing that you can’t see: a warm sweater or MEC polar fleece (soft shell breathes well, but requires good insulation in the cold) and thermal socks. What I normally wear for riding that I took off for photo shoot: eye protection — sun glasses in sunny conditions, clear glasses in cloudy or at night. Protecting your eyes is a must! It’s one of the best times of year to ride! With the right gear, the cold’s really not a problem. Riding generates a fantastic amount of internal heat, which keeps you going. The air is crisp and really, who wants to stand in the cold waiting for a streetcar? Jared Kolb is director of campaigns and membership for Cycle Toronto. View Jared and Lynda’s individual profile here. Photos by Yvonne Bambrick and text compiled by dandyhorse staff. Yvonne Bambrick is a photographer and urban cycling consultant who also coordinates Pedestrian Sundays in Kensington Market. She also works at the BIA coordinator for two vibrant downtown neighbourhoods. Yvonne has been riding year-round since 2000, but have been using cycling for transportation since 1992.
dandyhorse will be doing more Bike Spotting than ever before in 2013. In January we’ll be posting some self-submitted winter Bike Spotting photos and stories from our readers, right here at dandyhorsemagazine.com/bikespotting and on the dandyBLOG. dandyhorse newsletter #1 – Happy Holidays!